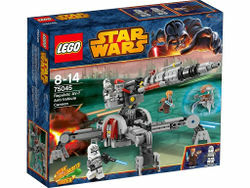 75045 Republic AV-7 Anti-Vehicle Cannon is a Star Wars set released in 2014. In some countries, this set was a store exclusive, meaning it was only available in certain stores in addition to LEGO Stores and the online LEGO Shop. United States: This set was exclusive to Walmart. This is a description taken from LEGO.com. Please do not modify it. (visit this item's product page) Bombard the Droid army with the Republic AV-7 Anti-Vehicle Cannon! When the Droid army advances, it’s time to call in the mighty Republic AV-7 Anti-Vehicle Cannon. Fold down the legs for ultimate stability, elevate the gun into position and get ready to fire the flick missile and powerful shooter into the path of oncoming enemy forces! Just watch out for the Droideka! Includes Plo Koon™, 2 Wolf Pack Clone Trooper™ minifigures with assorted weapons and a Droideka™. Facts about "75045 Republic AV-7 Anti-Vehicle Cannon"
Bombard the Droid army with the Republic AV-7 Anti-Vehicle Cannon! This page was last edited on 15 March 2016, at 06:06.